What a week it's been! As of this morning, I am done with my business taxes for the year!!! (Insert a HUGE party here!) If I could do cartwheels, I would do 100 of them. I find it highly challenging to run a small business, but I am also very thankful that I get to do this. If you've bought a pattern or a book, taken a class or attended a trunk show/lecture that I've given, thank you! Your support means so much!!! Ok, now, on to some fun, crafty finishes! 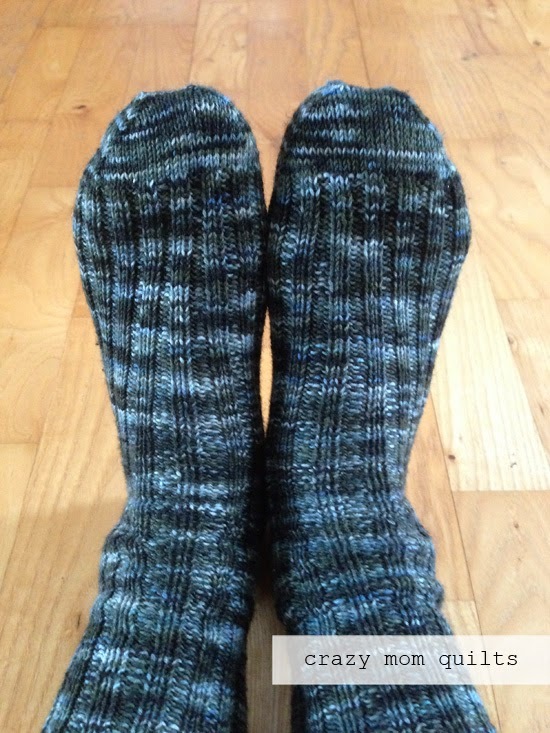 Yesterday, I finished my 12th pair of socks to date. They only took me a month to knit, which feels super speedy! They are pretty unexciting, color wise, but they will match about 80% of my wardrobe. Funny how that works, eh? I'm happy to say that photographing socks is getting a wee bit easier. Hurray! 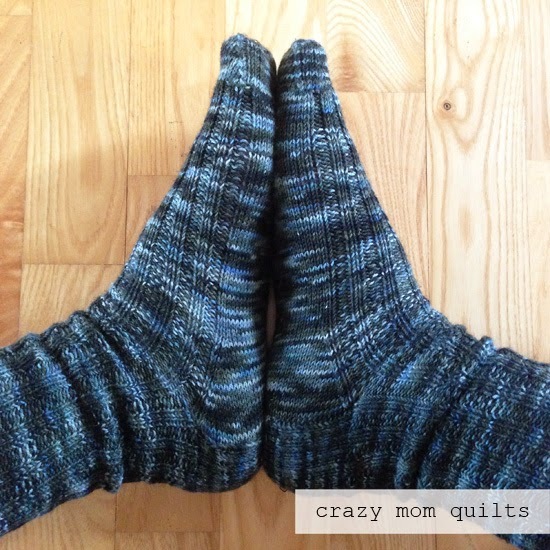 I used my basic sock pattern, which is available as a free download here. I can't tell you how much I love wearing hand knit socks. I'm pleased that my collection is growing. 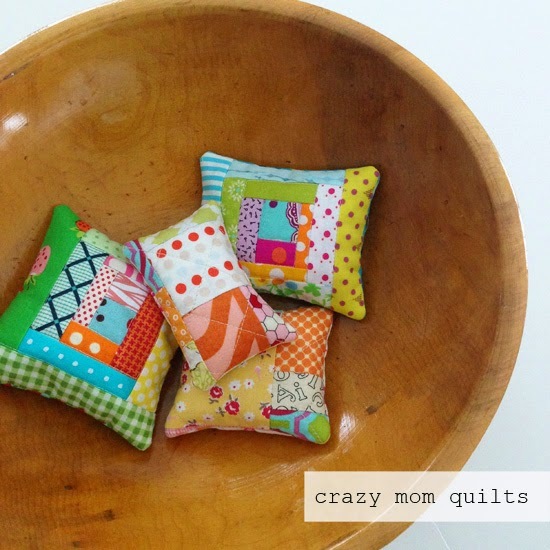 Speaking of a growing collection...I made a few more pin cushions for my craft room "candy dish". (See this post if you missed it last week.) 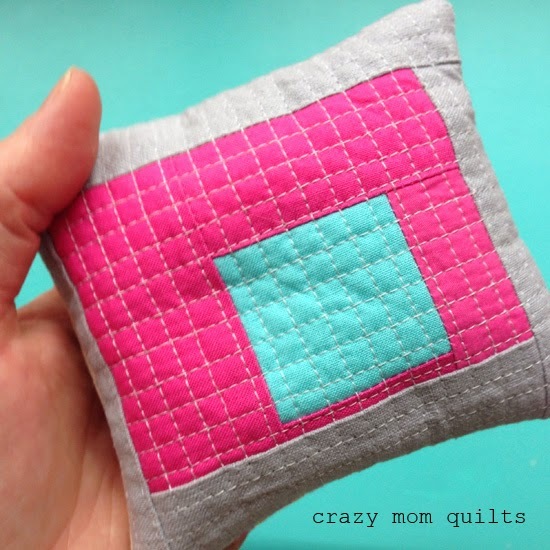 This is another little orphan block turned pin cushion. 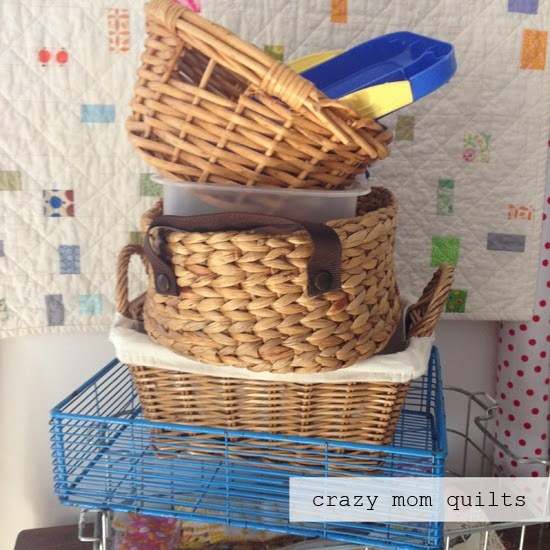 Slowly, one by one, I am cleaning up odds and ends around the craft room. It feels great! I love the dense grid quilting. 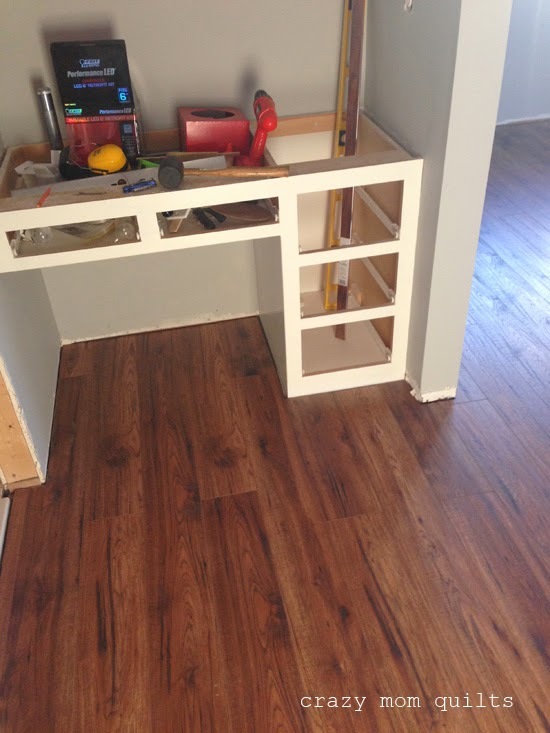 So fun on a tiny project! This one was NOT a quick finish and it was a bugger to turn. 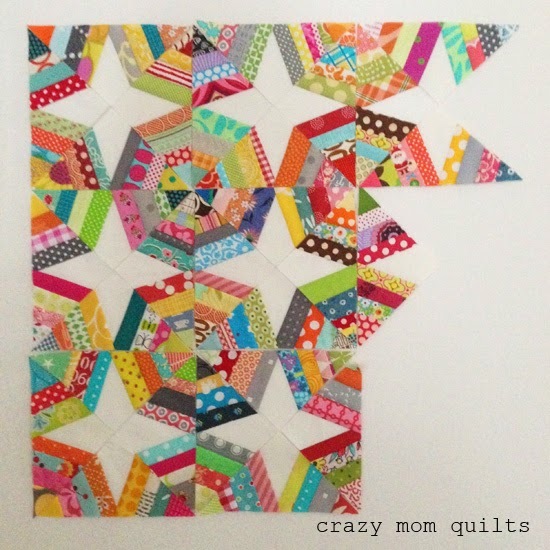 Inspired by my bright birch trees quilt, it uses the smallest of scraps. I LOVE how it turned out!! It's about 3.5" x 3.25" finished. Tiny! A note about pin cushion filling and construction: For the filling, I use crushed walnut shells that I buy from the pet store. (They are sold as lizard litter.) 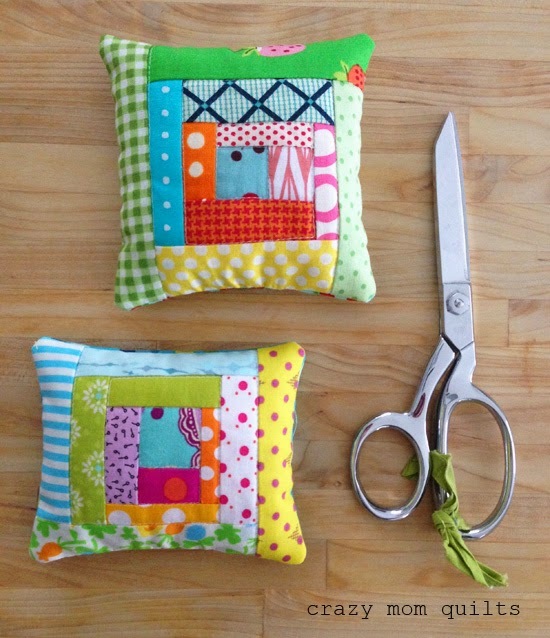 One big bag makes a BUNCH of pin cushions. 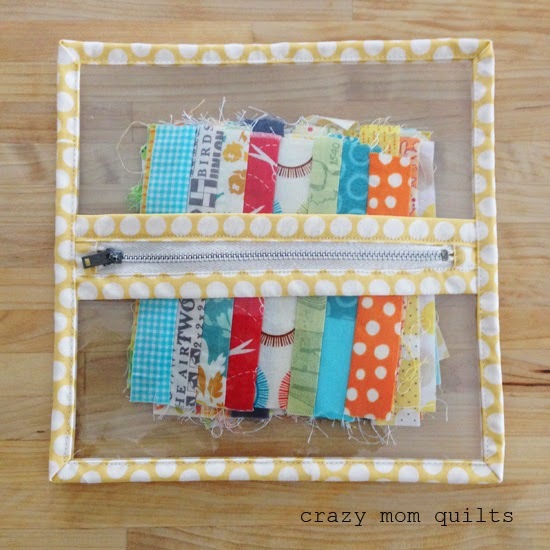 For the construction, I make a quilt block, quilt it onto a piece of scrap batting (no backing required). For the other half of the pin cushion, I do one of two things: I use ticking (without interfacing) OR quilting cotton with a layer of Pellon SF 101 interfacing fused to it. The interfacing gives the back a bit of stability and prevents the need for an inner liner. I hope that answers any questions that you may have! 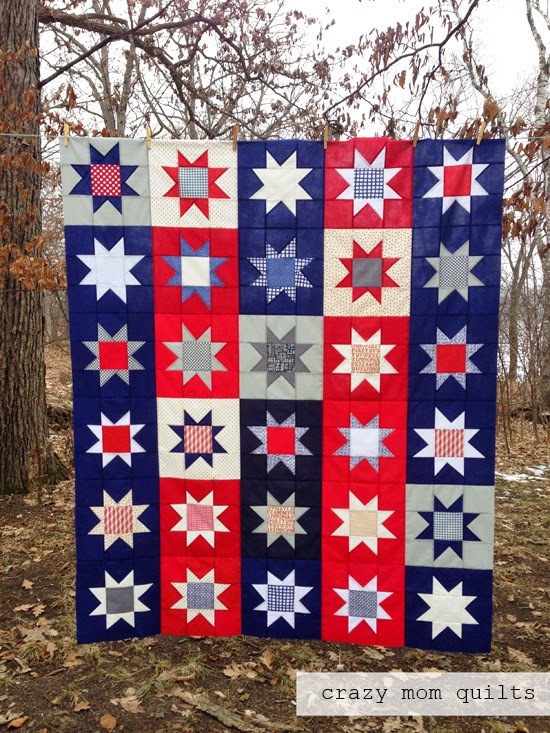 My intention with this project, besides making a quilt for Quilts of Valor, was to make a block a day for the month of January. Or, a block a day for 30 days, I should say. In reality, I ended up making 2-3 blocks every 2-3 days, which was perfectly fine by me. The work was still getting done! 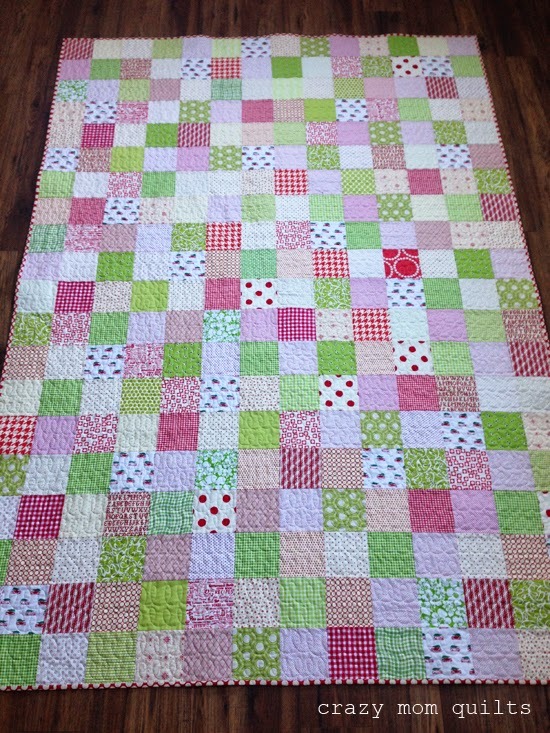 Today, though, I realized I only had 5 blocks to make, so I made all 5, and proceeded to sew the whole thing together. Instead of going with a completely random layout, I chose to work in columns of color, then pop in a few random blocks here and there. I really like how it turned out! For the fabric, I started with a bundle of American Made Brand Solids, then added a few prints for variety sake. The American Made Brand solids were nice to work with! Not too thick, not too thin...just right. 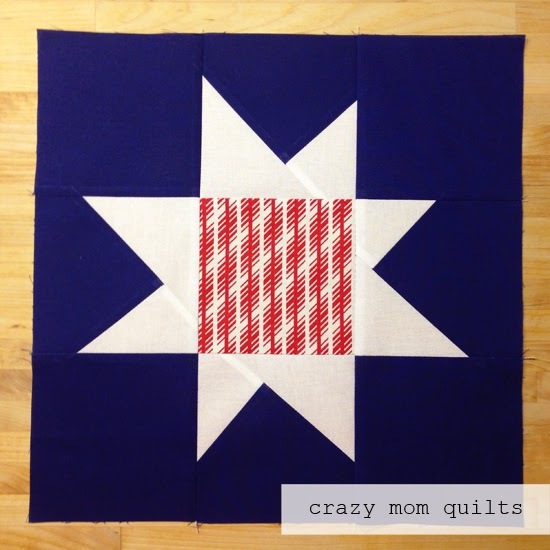 For the block, I used the maverick star tutorial here. 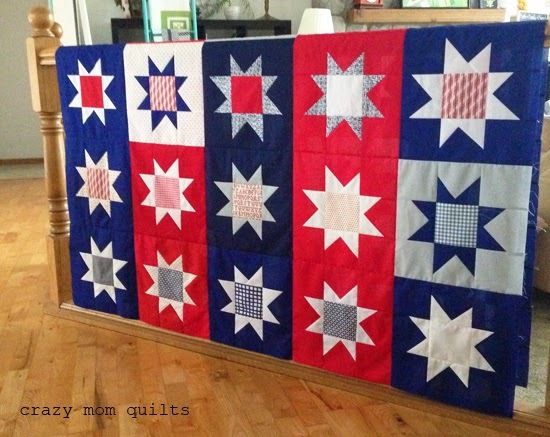 The quilt top measures about 60" x 72". There hasn't been a ton of sewing going on here this week, but I managed to make 3 more WIP bags. I've made 7 total so far and I'm almost done tweaking the construction. Hurray for that! Now I just need to figure out all the sizes. All in the name of product development. :) Maybe all 20-something of my projects will have cute bags by the time I'm done writing the pattern! This is the smallest WIP bag that I've made so far, finishing at 8". Isn't it cute??? I still haven't run out of my stash of zippers. AMAZING! Like most projects that I embark upon, this idea has been rolling around in my noggin for awhile. 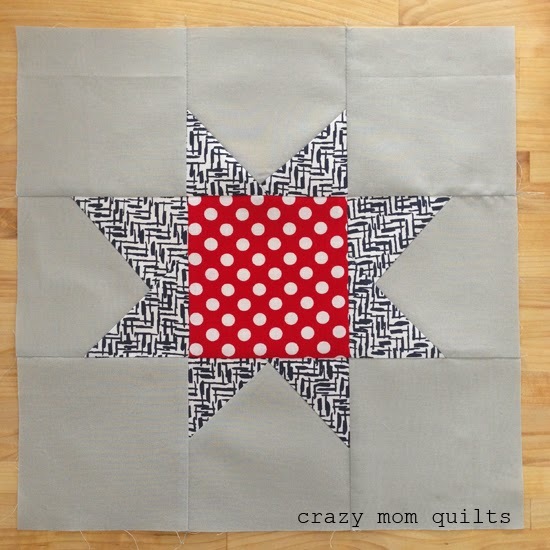 I love the spider web block and I made a twin sized quilt using the pattern back in 2010. Since then, I've been wanting to make another. This time I shrunk down the measurements and it turns out I love it even more when it's pint sized! My first attempt was to start with a 5" square, but that was still too big. My second attempt, starting with a 4" square, was spot on. It's small, but not so tiny that it is ridiculous. Well, that MAY be up for debate. Ha! 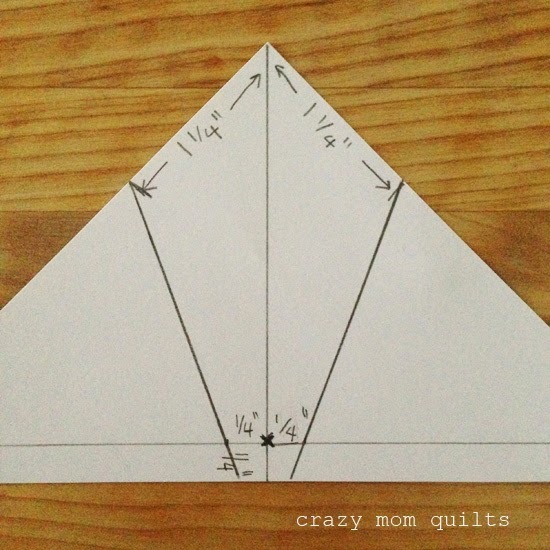 Take a 4" square of paper and cut it in half on the diagonal once. One triangle will be used to make your template. The other triangle will be used for foundation piecing. 1. Draw a line perpendicular to the bottom edge of the paper that intersects with the top point of the paper. 2. Draw a parallel line 1/4" from the bottom of the paper. 3. From the top point, measure and mark 1 1/4" down on each side of the paper. 4. From the X, mark 1/4" to the left and 1/4" to the right. 5. Connect the top marks and the bottom marks to form a kite shape. Cut on the two angled lines and discard the triangles. The kite shape is the center template. 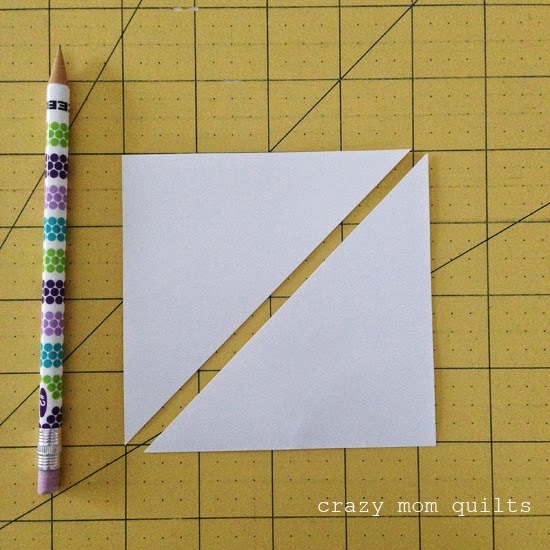 You will use this template to trace and cut fabric pieces. (I used white fabric for the kites in the quilt shown.) If you plan to make a bunch, you may want to trace it unto a piece of cardboard or template plastic, because it will hold up much longer than a single piece of paper. 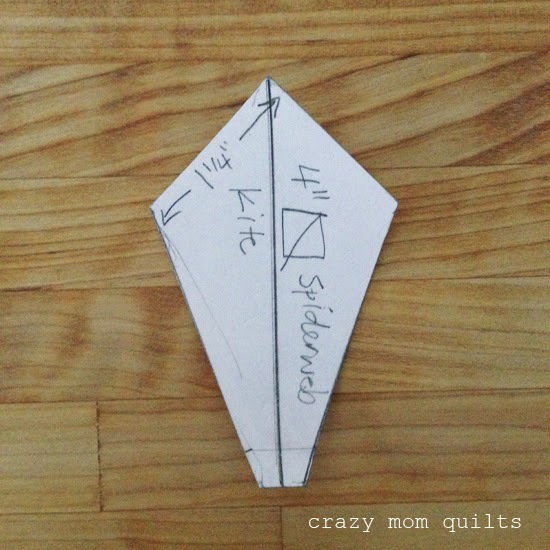 Trace and cut a few fabric kite pieces. 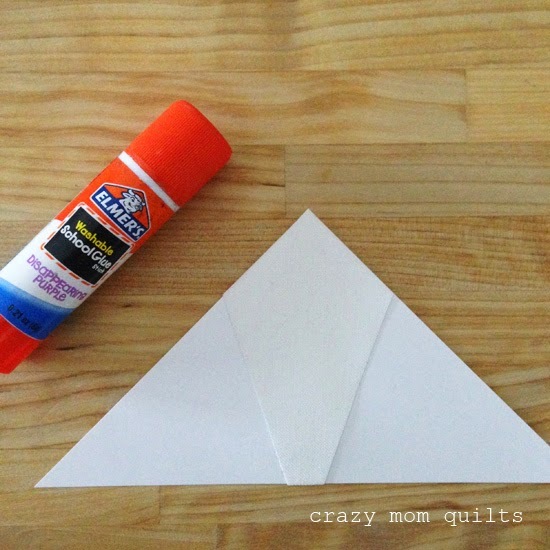 Take the remaining paper half square triangle, and glue one fabric kite onto it. For the block assembly, I used the same steps as shown in this tutorial. Most of the strips I used are about 1" wide. 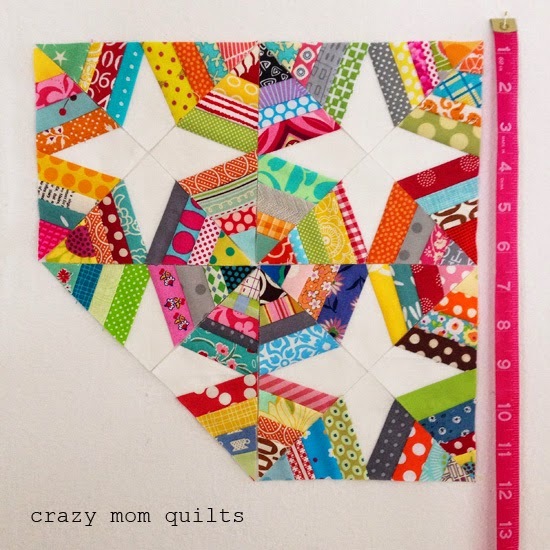 Some of these scraps are teeny-tiny! 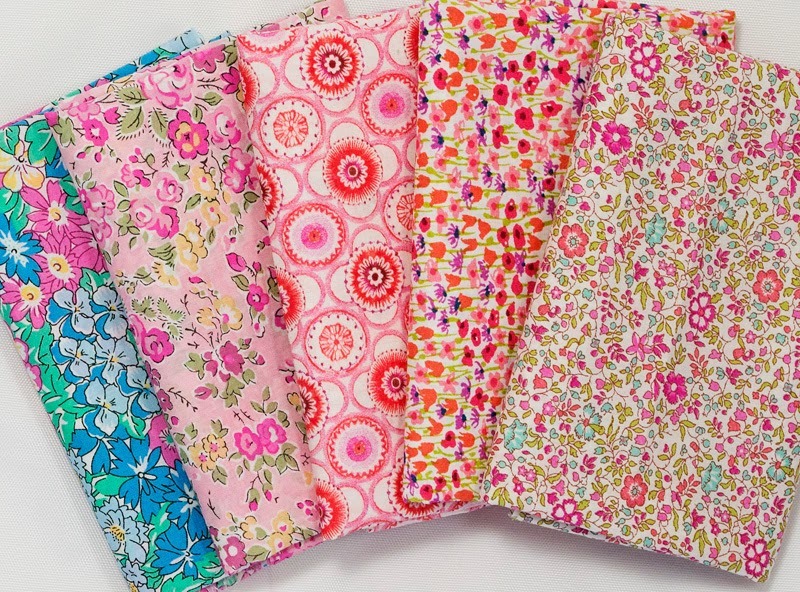 The winner of the Liberty tana lawn bundle is Boo McCready! Thanks to all of you who entered the giveaway! 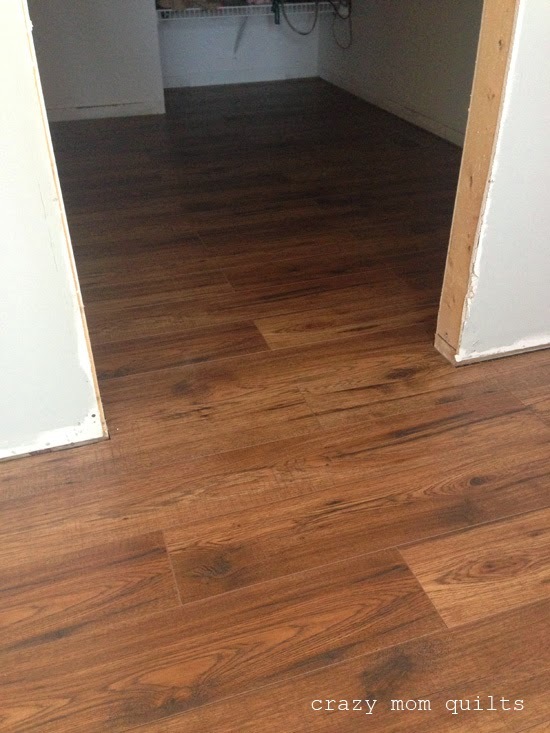 Also, a BIG thank you for your kind comments about my new floor. Each and every one is much appreciated! 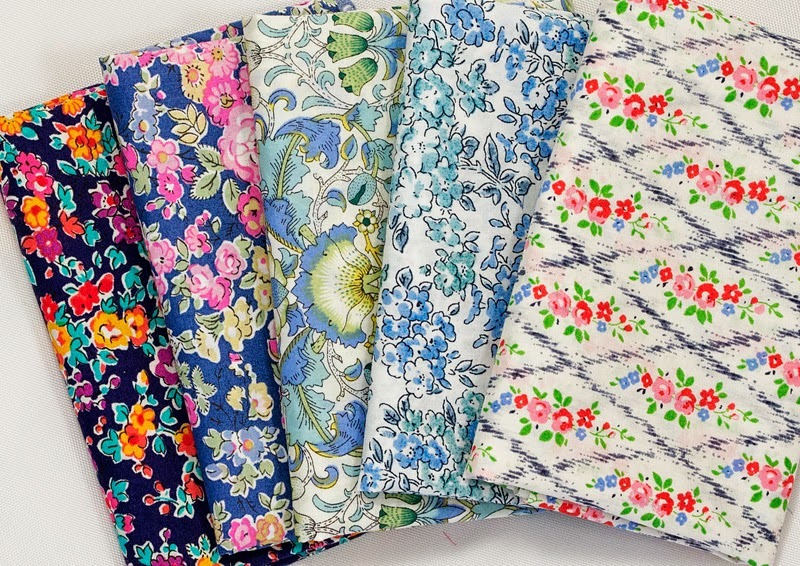 Anna recently started carrying Liberty of London fabrics in her shop. If you are unfamiliar with Liberty tana lawn, it is fabric of the highest quality. If I had only one word to describe it, it would be "fine". It's really, really lovely! I've worked with Liberty fabrics in the past, and even though they are fine, they are easy to work with. I made a cute little mini HST quilt that currently hangs in my hallway. I also made this little mini (tutorial included) that now lives at Mary's house. It's the kind of fabric that you use every last bit. Oh wait, I do that with most fabrics. Ha! Anna's goal is to make Liberty more affordable for everyone. Thank you, Anna! 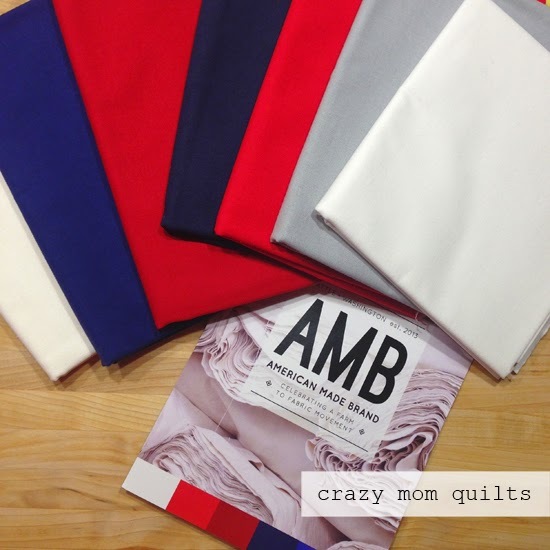 If you are in the market for Liberty fabric, be sure to check out her shop. You can buy it by the yard (starting with a 1/4 yard) or in bundles. Now...for the giveaway! 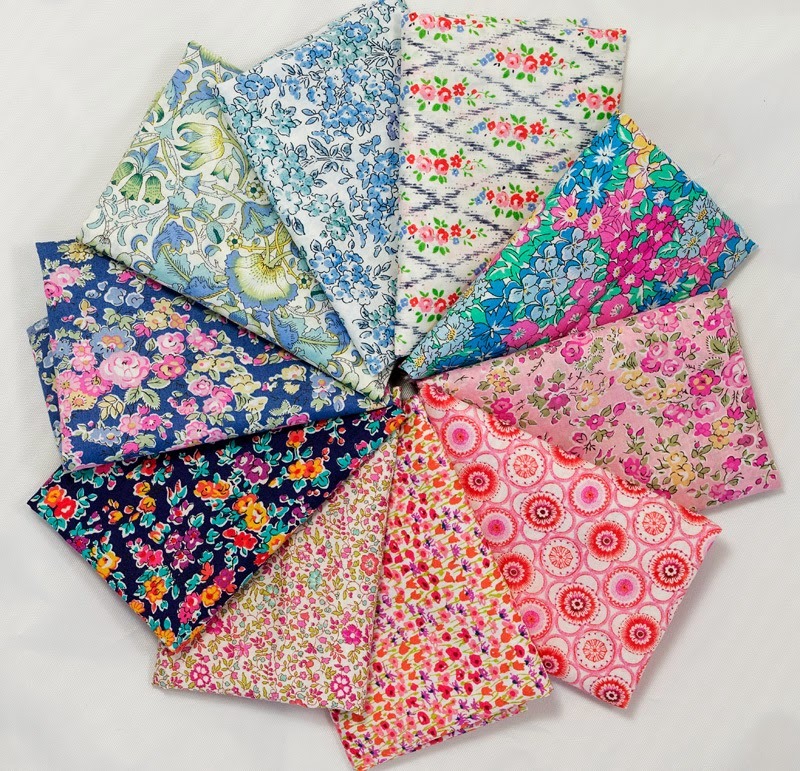 If you would like a chance to win a 10 piece bundle (each piece is 9" x 13") of Liberty of London tana lawn fabrics, please leave a comment on this post. In your comment, I'd love to hear what you are working on today. I will pick a giveaway winner in a few days! As for me, I'm working on writing a pattern for my WIP bags...and the zipper measurements are kind of kicking my tail at the moment. :P Here's hoping for a break through soon! Over the weekend I worked on a prototype for some WIP (work in progress) bags. It occurred to me that I could spend the time finishing some projects instead of working on these, but lets face it...WIPs are a part of life. They might as well be pretty (and contained) while they sit around. Right? They were made from supplies I had on hand in my craft room, including clear vinyl, thrifted zippers and of course, fabric. 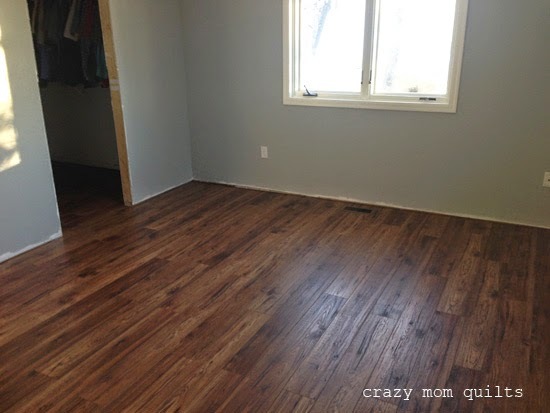 (Hurray for a well stocked craft room!) I'm very happy with how they turned out! 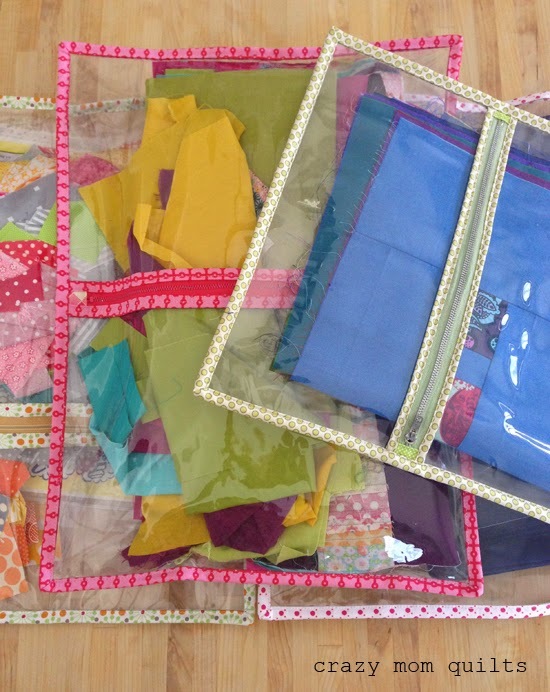 I made them in various shapes, sizes and colors (based on the zippers I had on hand). One nice thing I discovered is that even though they don't lay completely flat when filled, they don't slip and slide around very much, because the vinyl isn't slick. That is a good thing! I don't have a "before" photo, but here is the "after". I've been storing my WIPs in this vintage record cabinet that my aunt purchased in 1969. (The receipt was still in it!) I'm so glad it's in my possession for the moment (it's on loan from my sister) and I'm even more excited that my WIPs are contained in it and that the doors actually shut. There's even room for a few more! Ha! These are the baskets/containers that were previously holding WIPs and are now empty. There is A LOT less bulk in the cupboard, and I can use these in other places. That is a good thing! I have lots more to organize. 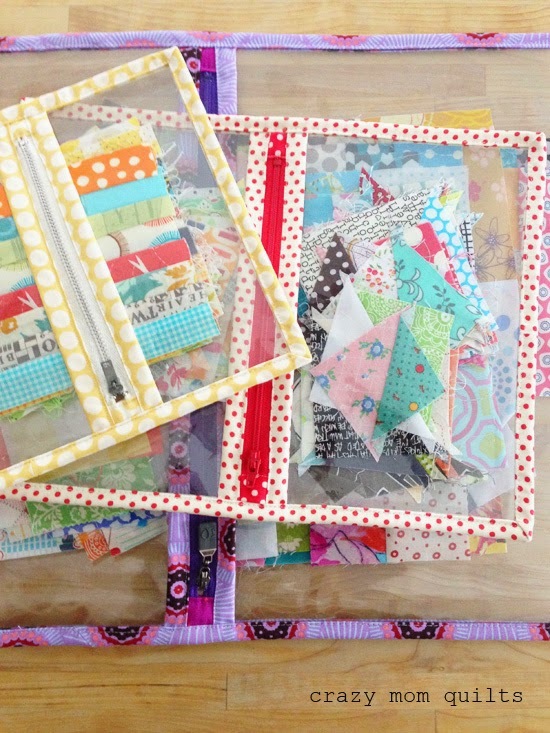 How do you store your WIPs? If you have any good tips or a system that you love, I'd love to hear about it! 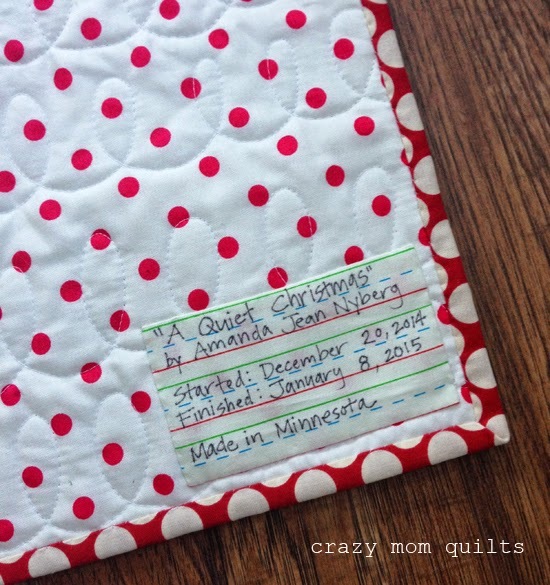 Yesterday I finished my "quiet Christmas" quilt! It looks dandy with my choose joy pillow, doesn't it? 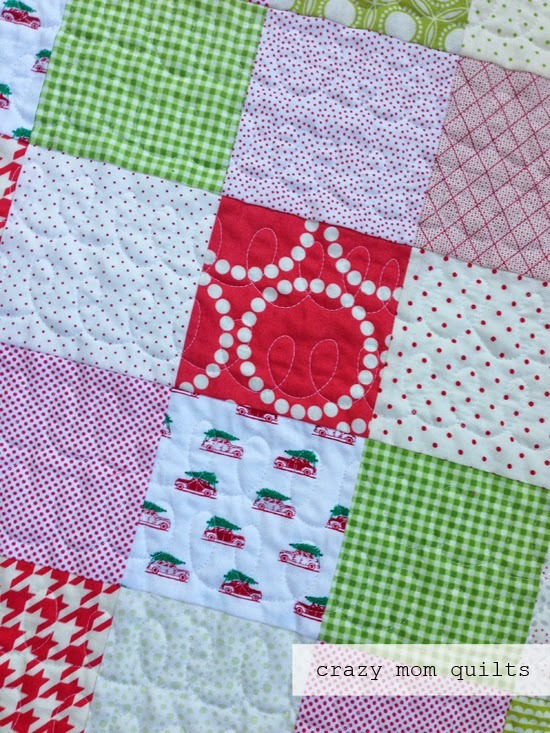 The quilt is made of 5" charm squares (cut from my stash) in a subtle Christmas color palette. There are LOTS of dots in the mix. 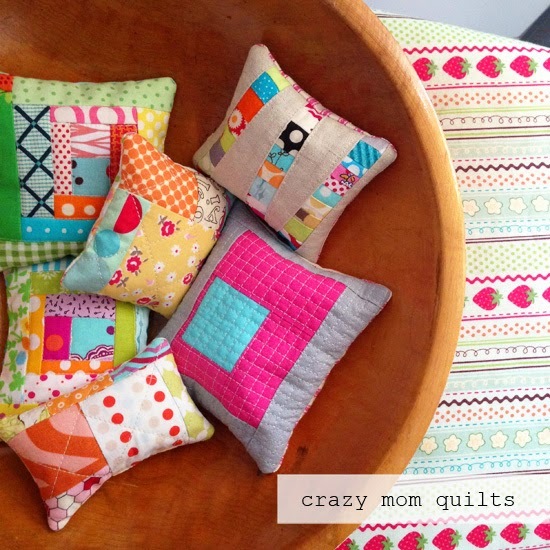 I always have and always will love the simplicity of a patchwork quilt. 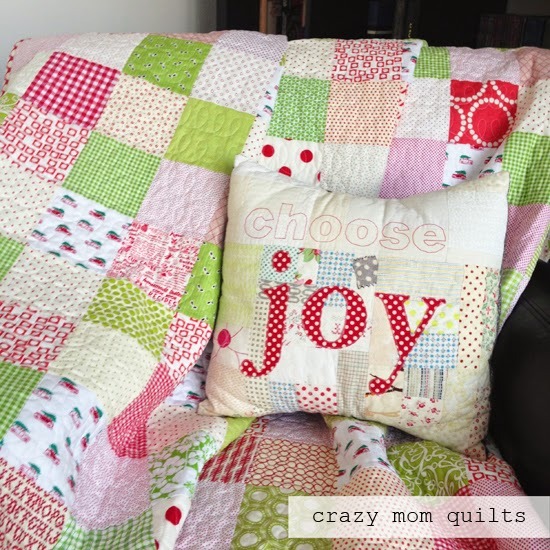 It's a great opportunity to play with color and it allows the pretty fabric to shine. No fuss, no muss. Speaking of lots of dots...the backing was patched together with 4 different dots from my stash. All of them are fairly low volume, in keeping with the front of the quilt. 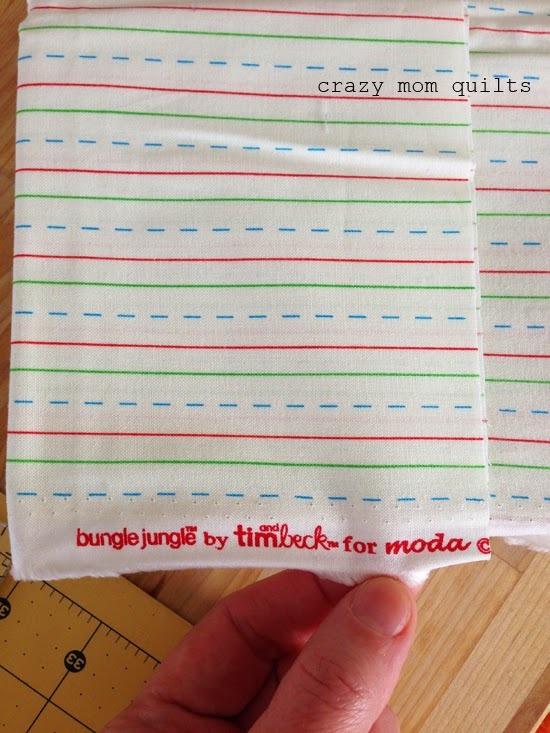 I still can't believe I did this, but I chopped up what is probably my oldest and most hoarded fabric (Apple Pie dots by American Jane for Moda) for the binding. I searched for the year that the fabric was released but I wasn't able to find it. It had to be around 2006-2007 or so? I cut off the selvedge years ago, so I can't tell. Ha! But, I do know that it's been in my stash for quite awhile! It's a good one and I am glad I used it! That single pearl bracelet square is probably my favorite block in the whole quilt. It's the perfect red! 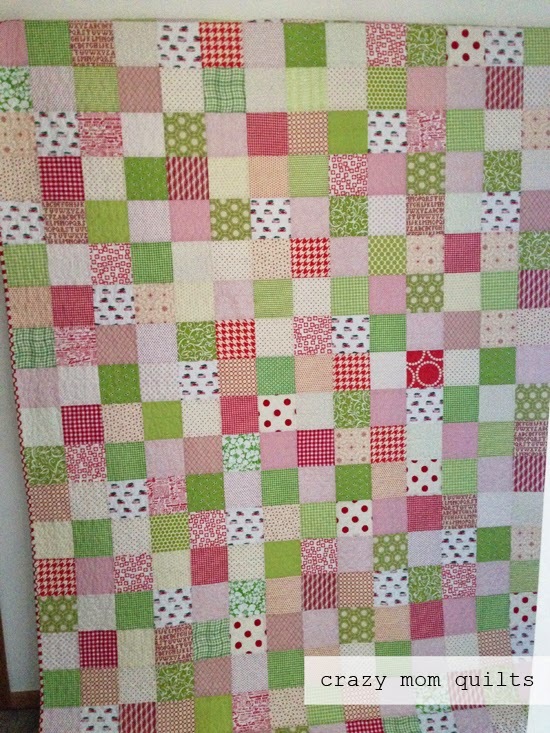 For the quilting, I did two lines of FMQ loops through each row of blocks, giving the quilt a nice soft texture. It went fairly quick for a twin size quilt. Hurray for that! And this is probably the best part...I added a label already-even though I'm keeping it. That's got to be a record! I started and finished this quilt in less than 3 weeks! That feels pretty great, too. 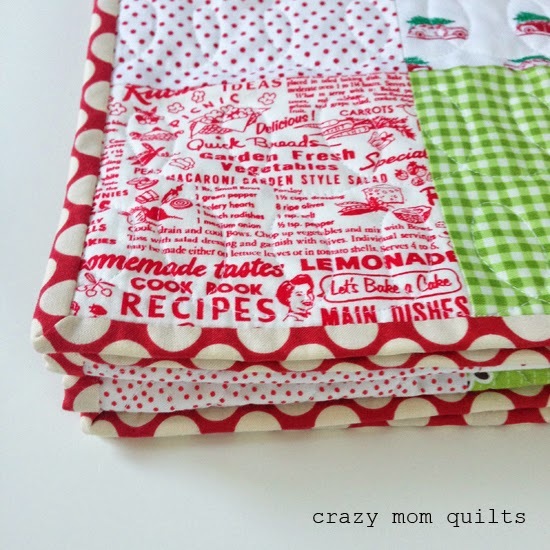 I have a tutorial "one way to label a quilt" here. And....I used a fine tip sharpie to write the label. Now it's your turn! Please link up with your finishes! Thanks for joining me for finish it up Friday! 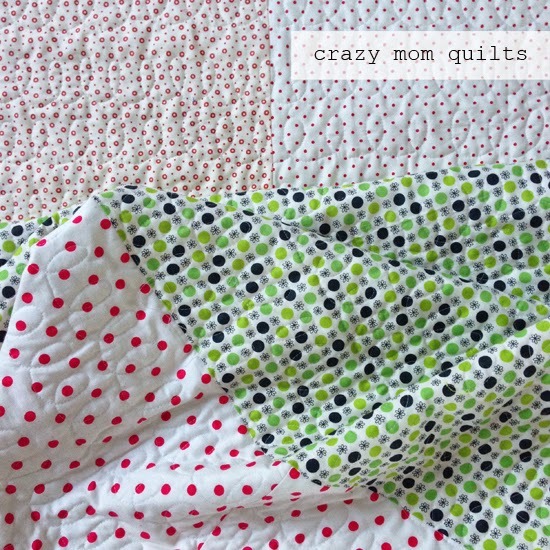 There is a quilt that I've been wanting to make for about 8 or 9 months now, but there is always so much going on that it's never gotten to the top of the list. I'm sure you can relate! Well, January is time for fresh starts and new projects (right?) so I thought it would be the perfect time to start this quilt. 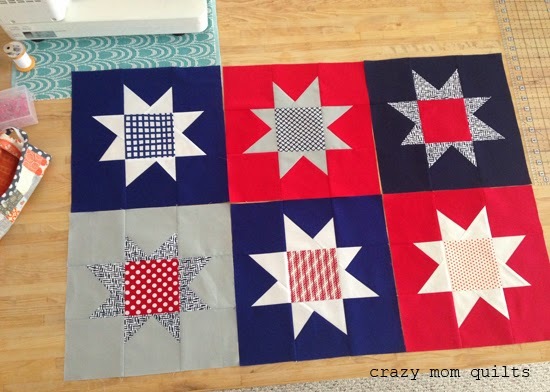 The idea is to break it down into manageable sections by making just one block a day and by the end of the month, or in 30 days, I will have enough blocks for a lap quilt. I'm making maverick stars, as shown in this tutorial. I made a few catch up blocks last night and today's block is done. Just like that, I'm back on track! I'm using American Made Brand solids for this project. This is my first time working with them and so far so good! 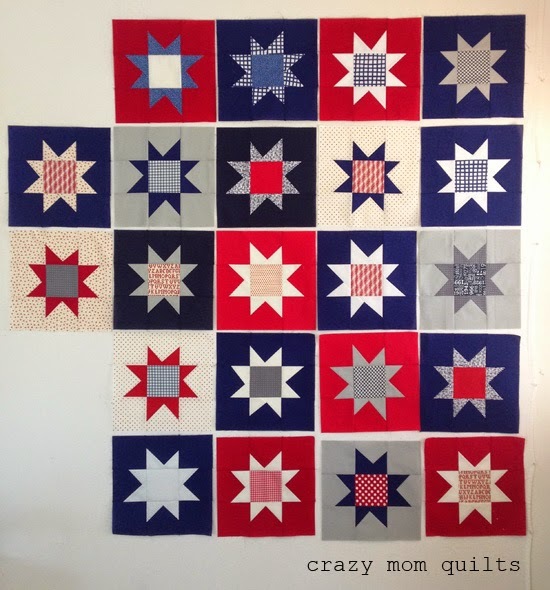 The idea is to make a quilt for Quilts of Valor using solids made in America....kind of a full circle thing. I'm glad to be jumping in to this project (finally), and I'm curious to see how well I can keep up on it for the rest of the month. I'll keep you posted! Have you ever tried the block a day thing? How was your success rate? I'd be curious to hear how it went for you. I'm really hoping I can stick with it...and if I can I'd like to try it at least a few more times during the year. 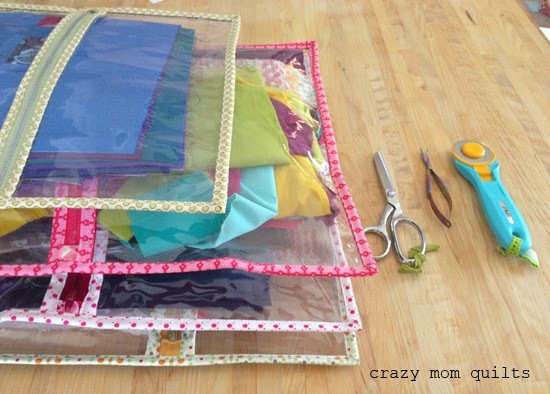 It's amazing how much sewing a little a day can add up! Happy New Year to you! I hope 2015 is off to a great start! I love looking back at the past year and making plans for the new year ahead. 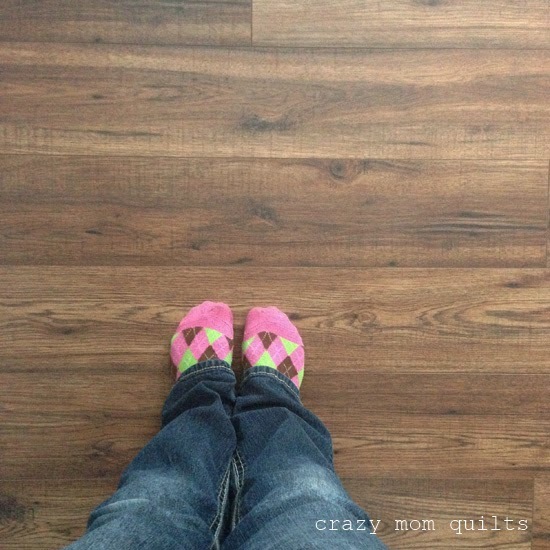 It's so nice to have it recorded here on the blog, too! This isn't a normal finish it up Friday post, but please bear with me. I'll give you a chance to link up at the end of the post as usual. So, 2014 was a big year! 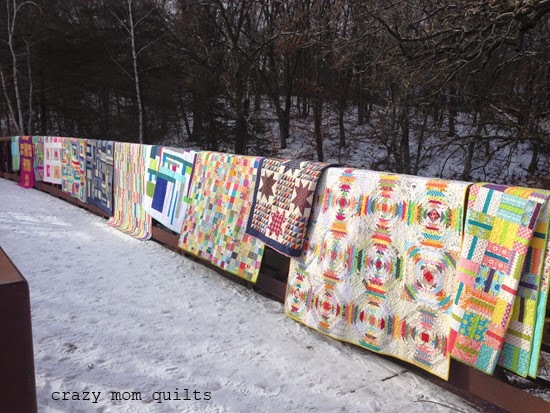 I finished 26 quilts. I gave away 11! I released one pattern (only one) but I did revamp several of my older patterns and got them printed. That was huge! I also completed my 101 scrap challenge! I had so much fun with that! As you can see from the photo above, I had a very scrappy year all around. It was a good year! I made and gave away 2. I gave 4. I have two set aside to give, but never got around to shipping them. Typical. 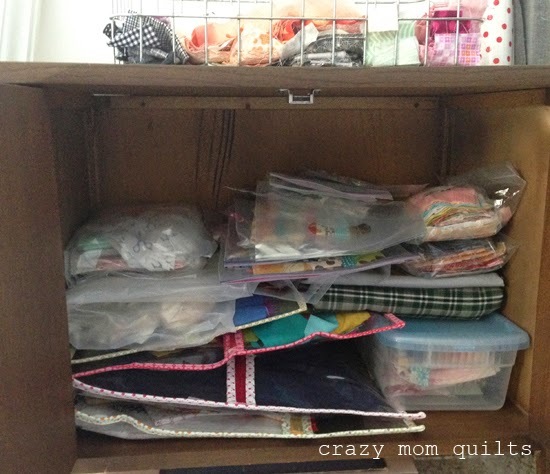 -I need to do some serious stash busting (always!). 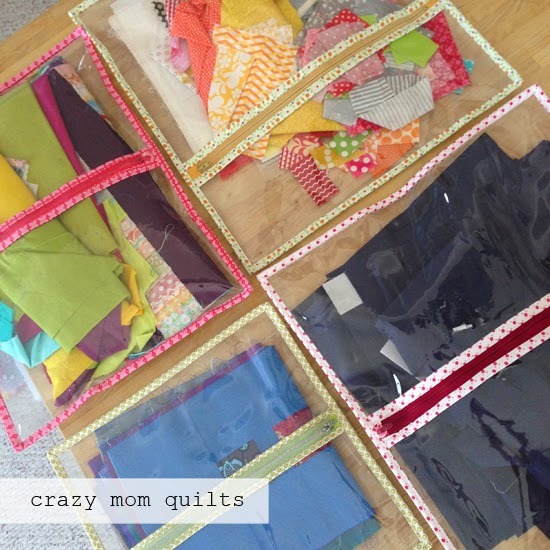 To be specific, it would be great if ALL my quilting fabric could be contained in my cutting table. (That's a lofty one!) I'll need to do some fast sewing and not much buying! I did this! And I did this well! I didn't buy fabric for 5 consecutive months! It took that long to make a dent in my stash and I'm going to attempt to go for one more month to make it an even 6 months. It felt so amazing to be able to accomplish this goal. -I'd like to keep working on patterns. Print and PDF. Wholesale. Maybe even distributors this year! My patterns are now being distributed through United Notions (Moda) and I'm currently working with Checker to get set up as a vendor. I'm so thankful for these big (exciting and scary) steps! -And, I'd like to continue to try to work on the family life vs. work life balance. It's always a struggle to balance the two, but it's definitely worth working on! This will always be a work in progress, but I think I did ok! 1. This is the year I make a quilt for my dad. He's about to turn 71 and he needs one...even it if will just sit on the back of his sofa. 2. 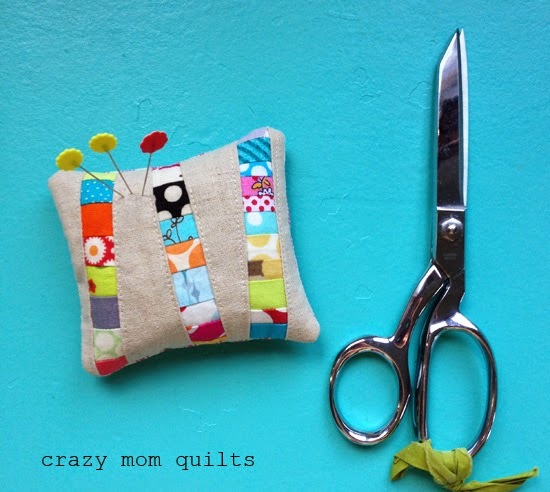 Teach a craftsy class. This one was on my list last year and I didn't "out" myself. I should have and maybe it would have gotten done? To be honest, this terrifies me to no end, but I'm determined to do it anyway. 3. Write-or start writing-another book. Again, I hoped to do this last year, but I didn't publically announce it. This is a TON of work and it's scary, too, but as my husband says, no risk, no reward. 4. This one will be very hard for me, but it's the only way I can accomplish the previous goals, is to blog LESS! And be ok with blogging less. I've been posting an average 3 times a week and I am going to try to cut it down to two. We will see how that goes. I'm going to give it a try in January and then I'll reassess. Oh, man. I can't believe I'm putting this all out there...but here's to a BIG year ahead! I'd better get stitching! Ha! Now it's your turn to link up your finishes! Thanks for joining me for finish it up Friday! Happy New Year to you and yours!